We’d love your help. Let us know what’s wrong with this preview of End of the World by Ty Drago. To ask other readers questions about End of the World, please sign up. Is it the final book of the series ? 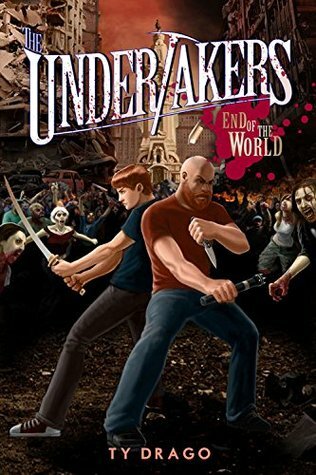 Today, I’m gonna talk about The Undertakers: The End of the World, the final book in Ty Drago’s Undertakers series. This book continues the story about aliens (malum) attacking Earth hiding inside people’s dead bodies. Will and his buddies gotta stop them. Mom: Wait – they are hiding in dead people’s bodies? That’s gross! Mom: But don’t they decompose? Dude: Yes! That’s what’s so cool about it. In the beginning, no one else can see it but the Undertakers. Mom: Okay… I’m disturbed. Continue… I’ll shut up, now. In this book, William ends up in the future where the aliens have destroyed the Earth. When he comes back in time, he tries to stop it from happening. I like this book because it was really nonstop action. And a lot of times you think that they really aren’t going to make it, but then they do make it. My favorite part of the book was when William sky-dived off the tower and ended up back in the present. I also liked the skate-boarding scene in the void because it was really intense, and if they didn’t skate fast enough they would die! The only part I really didn’t like was that the book was unclear what happened to [name removed] at the end. I wanted to know what happened to [name removed], and I thought he was dead, but then something else happened and [spoiler removed] – so I was just unclear on all that. But that didn’t stop me from liking the book overall. The stuff in the beginning was really good, but most of the really intense action stuff happened at the end. Those skate boards – I mean seriously – intense. Overall this book was really, really good and I enjoyed the entire series. I’d give this book 4.5 stars out of five. The entire series I would give 4.9 out of five stars. This is the second best series I have ever read. I really enjoyed this series. Book 5 wraps it all up. This was not my favourite book in the series, but I did like the ending. The series is definitely worth a read. I'm the author of the UNDERTAKERS series for middle grade readers, the first two books of which, RISE OF THE CORPSES and QUEEN OF THE DEAD, were published by Sourcesbooks in 2011 and 2012 respectively. Since then, Month9Books picked up the rest of the series, releasing SECRET OF THE CORPSE EATER in 2014, as well as LAST SIEGE OF HAVEN and END OF THE WORLD in 2015! There's also a special Undertaker I'm the author of the UNDERTAKERS series for middle grade readers, the first two books of which, RISE OF THE CORPSES and QUEEN OF THE DEAD, were published by Sourcesbooks in 2011 and 2012 respectively. Since then, Month9Books picked up the rest of the series, releasing SECRET OF THE CORPSE EATER in 2014, as well as LAST SIEGE OF HAVEN and END OF THE WORLD in 2015! There's also a special Undertakers novelette entitled NIGHT OF MONSTERS. All of them are available in bookstores and elsewhere Check 'em out! Furthermore, I'm thrilled to report that RISE OF THE CORPSES has been option for a feature film by Moderncine and adapted for the big screen by none other than Jeffery Reddick, the creator of FINAL DESTINATION! In addition, I published PHOBOS, a science fiction noir through Tor Books in 2003, as well as THE FRANKLIN AFFAIR, an historical mystery, which was released by Regency Press in 2001. My short fiction has appeared in SPACE AND TIME MAGAZINE, HAUNTS, AFTER HOURS, PANDORA, MIDNIGHT ZOO, PLANET MAGAZINE and AMAZON SHORTS. Another story snapped up the Grand Masters spot in a Fortress Publishing anthology titled "Yesterday, I will." I've also published articles on the craft and business of writing, in such venues as WRITERS DIGEST. And, finally, since 1998 I've been the publisher/managing editor of ALLEGORY, a premiere online fiction magazine and paying market for science fiction, fantasy and horror stories from around the world. Sounds halfway impressive, doesn't it? I currently live in Southern New Jersey with my beautiful wife, Helene, a dog and two cats. Since November, 2013, I've been a full-time writer, though how long I can keep that up is anybody's guess. But, for now at least, I'm living the dream!